Not a lot of sewing this week, but I finished this charity quilt today while enjoying a vacation day. The fabric was from a fat quarter collection from Sew Sisters Quilt Shop. 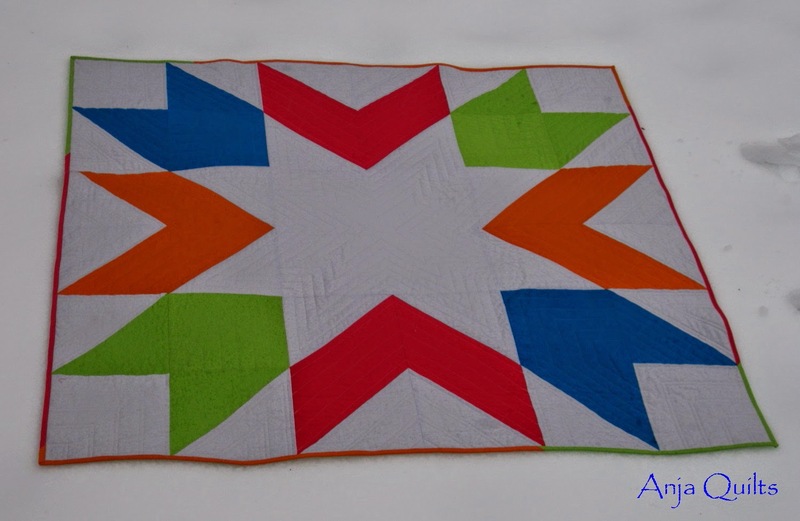 Linking up with Finish It Up Friday over at Crazy Mom Quilts and with TGIFF over at From Bolt to Beauty. quilt-as-you-go pillows that I am not enjoying -- I hate to waste fabric, but I'm thinking of tossing this WIP and trying another QAYG pillow project. 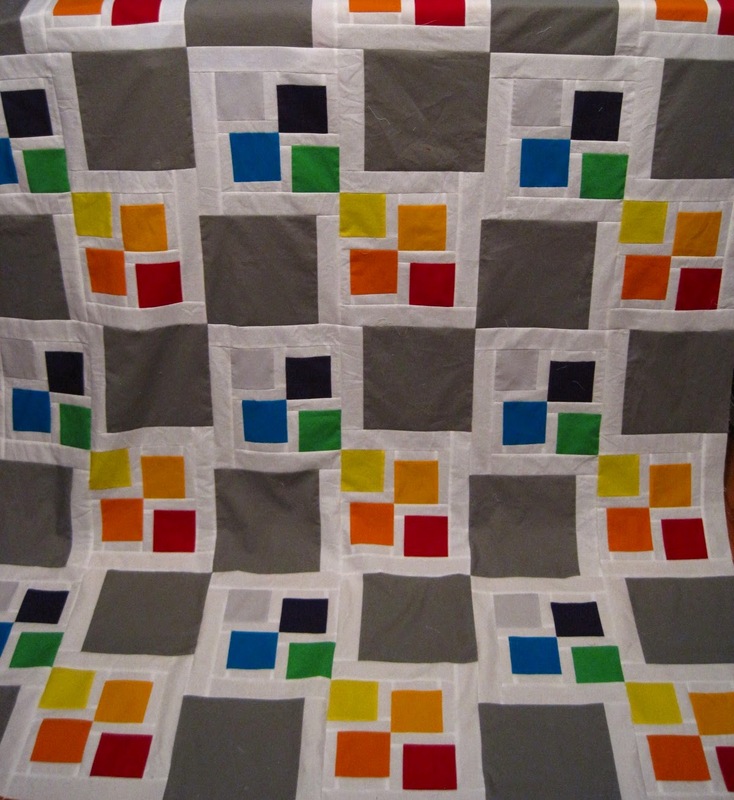 Gray Square Scramble - not sure know how to quilt - Would love to hear your suggestions. 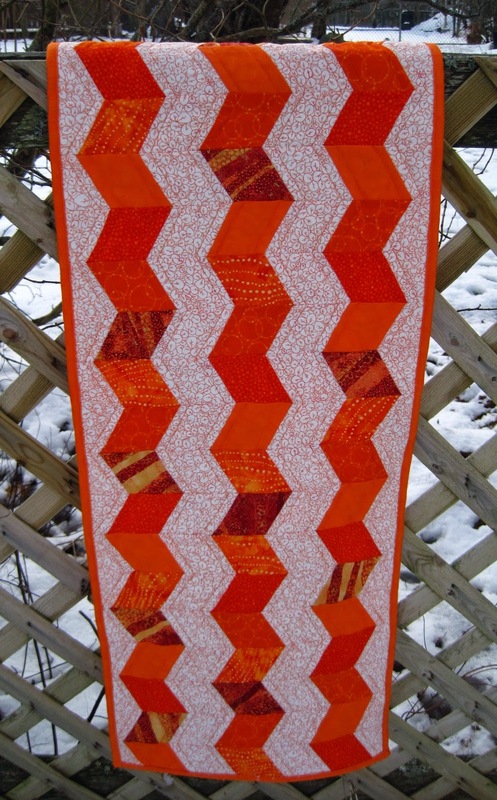 Debby Kratovil's Block of the Month 2015 - I'm drawn to this, so might give it a try. I'm sure more items will be added throughout the year as I see new projects that I MUST try. I may not finish everything on this list, but I'm okay with that. The list is to keep me focused and on track. 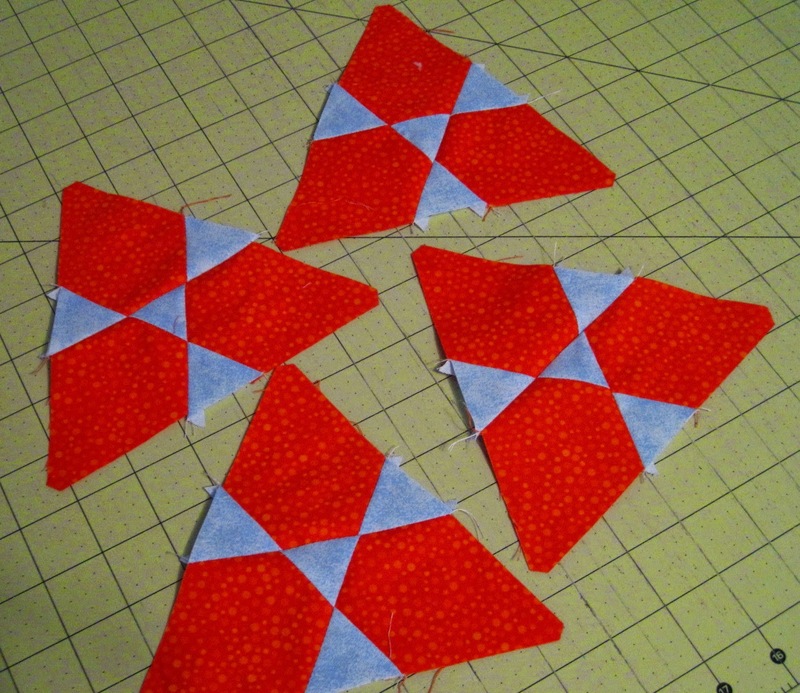 The goal for today was to piece (and hopefully quilt) Mini Lotus. The instructions are clear and the piecing fairly easy, but...the pieces are soooo small. I was not in the right frame of mind for this project today so only 4 blocks of 28 were completed. The sides are about 6 inches long. 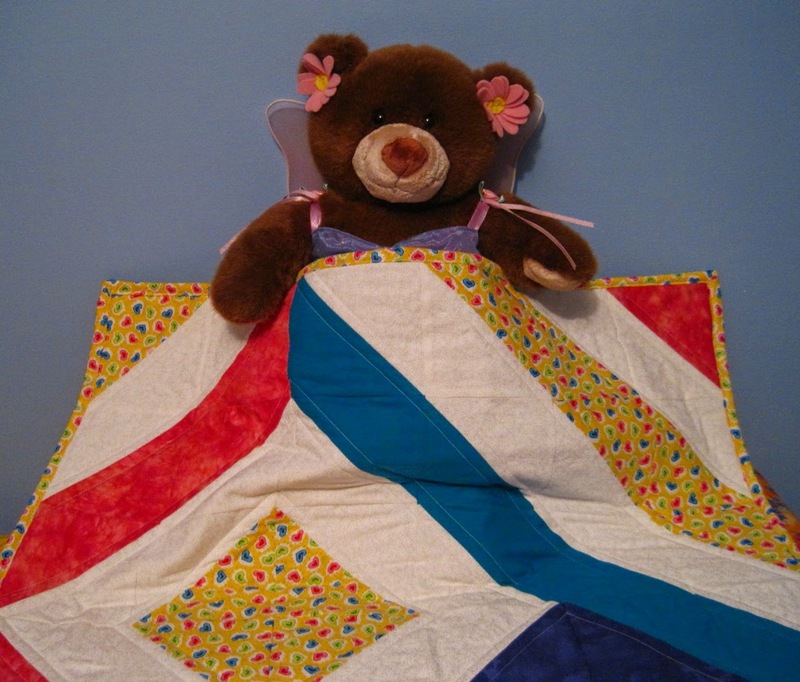 Next on the list was a doll quilt for my goddaughter's Build-a-Bear Sarah. I was using leftover 5-inch squares so had to be creative with the layout. I think it's time for a new camera or better lighting in my sewing room -- the triangles on the left side are purple, and the long strip of triangles next to the purple is teal. The colours clearly did not come through. Blue testing the quilt to make sure it's warm enough. Give this girl a gold star...make that two gold stars!! Two finishes to brag about. Thanks for the suggestions on how to quilt the Seaside table runner. 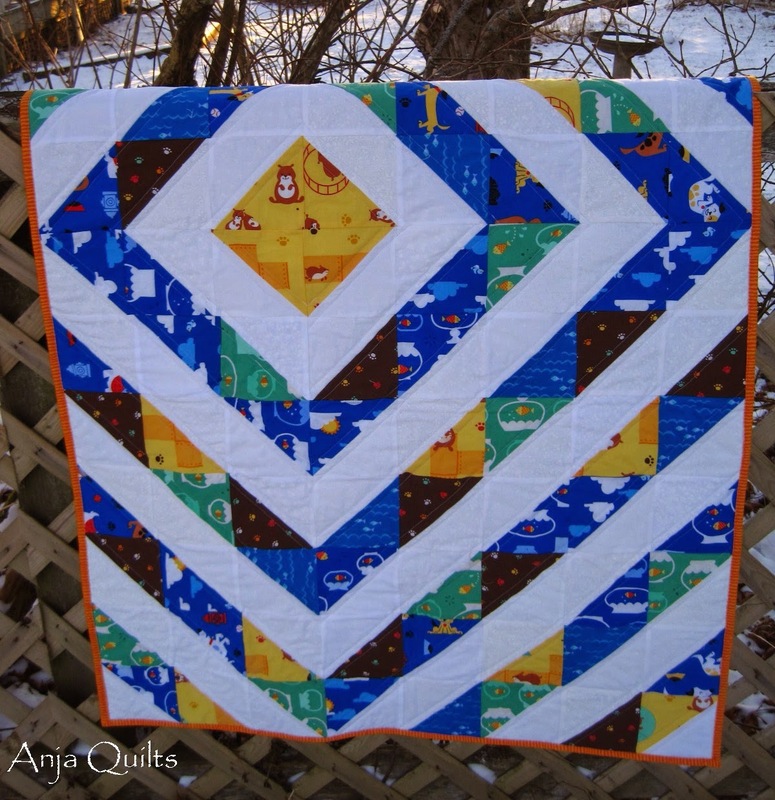 Zig zag quilting was the winner, which was my first thought. 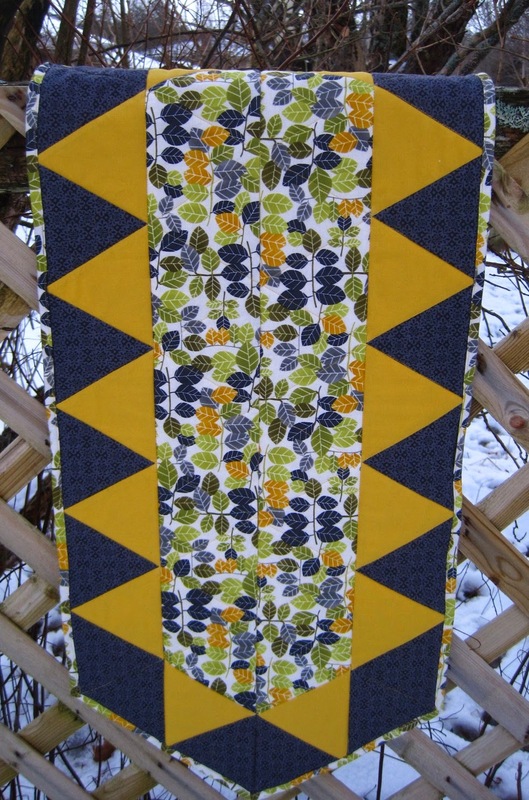 This was my first attempt using Jaybird Quilts' Sidekick ruler. Great ruler, with lots of versatility. On to the Atkinson Designs table runner. The Hex N More ruler came in handy for cutting the triangles. That's Kona Curry in case you were wondering. This project was quick to cut out and just as quick to piece - will definitely use this pattern again. Two projects completed on my 2015 to-do list (which is still not fully finalized). What a great way to start the year. Hoping to continue this quilting high and finish the Mini Lotus this weekend. My ability to sew has been limited for the past week, so cutting has become my new hobby. As this WIP is smaller than the other projects I have on the go, I'm hoping to get it pieced tonight. Can't wait to see how it looks put together. Not quite orange enough for me, but I love them anyway. Thanks to a tip from Jenn over at A Quarter Inch from the Edge, these were ordered from Mommie Made It. 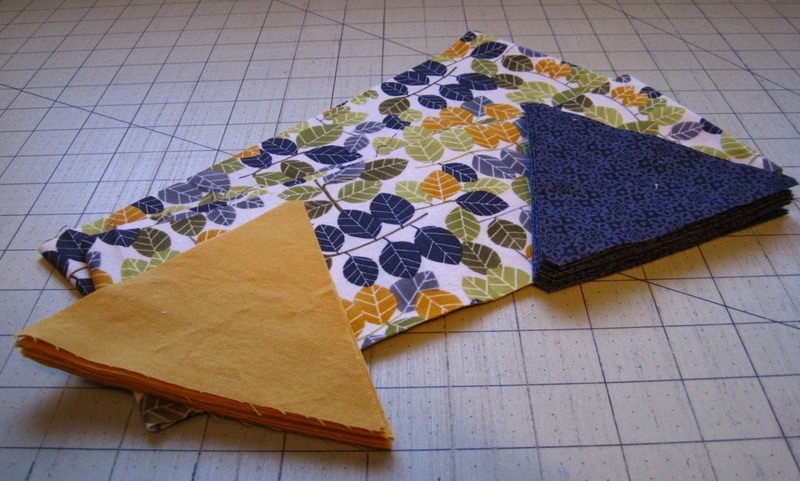 Not much sewing this weekend but managed to cut fabric for the Mini Lotus from Jaybird Quilts. I won the pattern and Mini Hex N More ruler from an online contest. Hoping that I'll be able to get some sewing done this week. It's an almost Finish Friday. The piecing is done on the Seaside table runner. 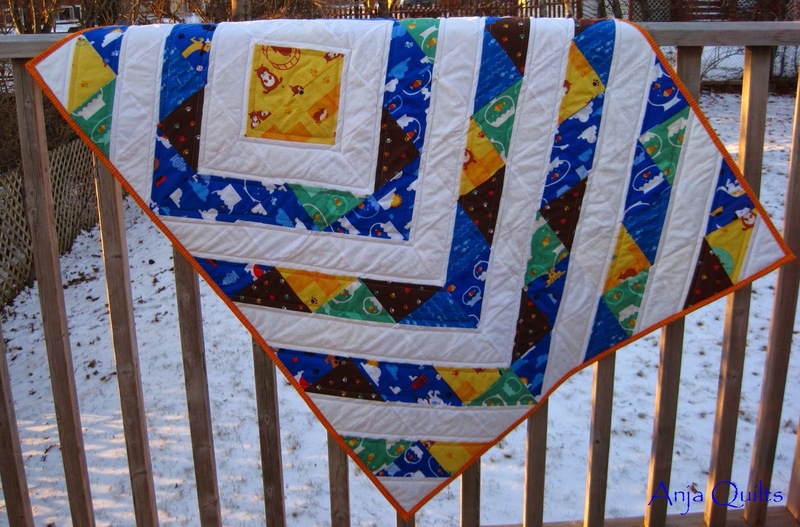 Still debating on how to quilt this. Would love to hear your opinions. Not much sewing this week, but lots of thinking about my 2015 project list. 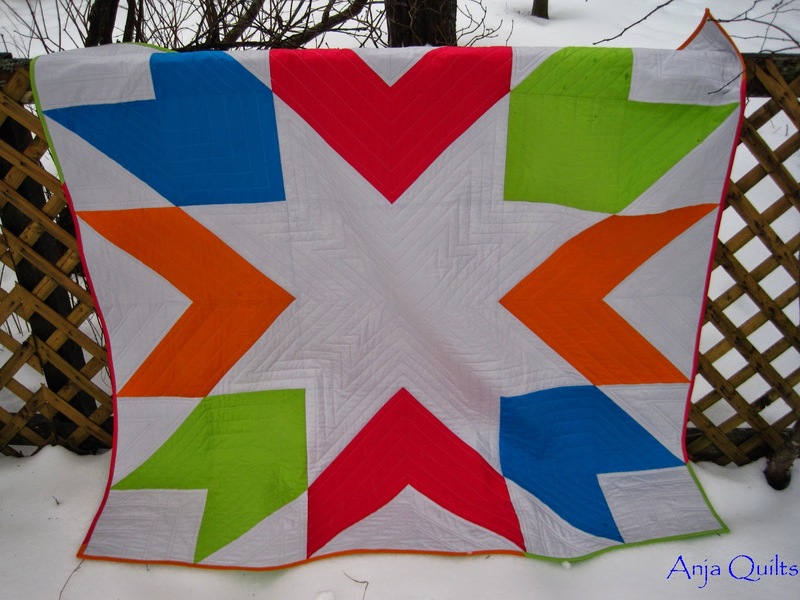 Linking up with TGIFF being hosted by M-R over at Quilt Matters. The past two weeks have been a good break from sewing and blogging...and everything else. 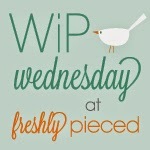 But now it's back to a regular routine...and to catch up on reading blog posts. Finished late afternoon today, amidst a snow/rain storm. I wanted to get some photos before it got dark. The rain seemed to slow a bit, so I ran out into the backyard. But sadly only had a few minutes before the rain quickened. And now it's really raining so had to hurry. No, QJ...I don't know what Kona colours I used other than Silver for the background. I suspect the green is Chartreuse. I'll have to figure out the colours so I can check them off on my new Kona colour check list. UPDATE: Kona colours are School Bus, Pomegranate, Turquoise, Chartreuse, and Silver. My 2015 project list hasn't made it to paper yet, although I do have some ideas. Seaside table runner by Jaybird Quilts - The fabric is cut and ready to be sewn. I'm not really a fan of table runners, but they do add something to a dining room table. 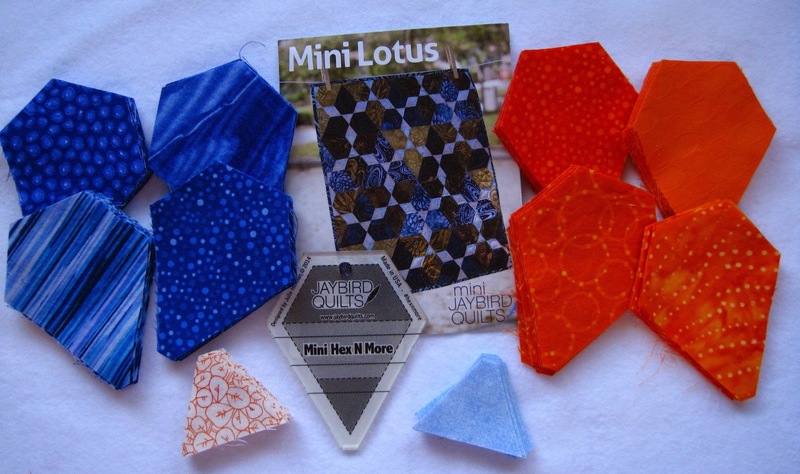 Mini Lotus by Jaybird Quilts. I won the pattern and mini Hex N More through an online contest. I'm hoping I have enough fabric from the Seaside table runner to make a matching wall hanging. Radiant Star. 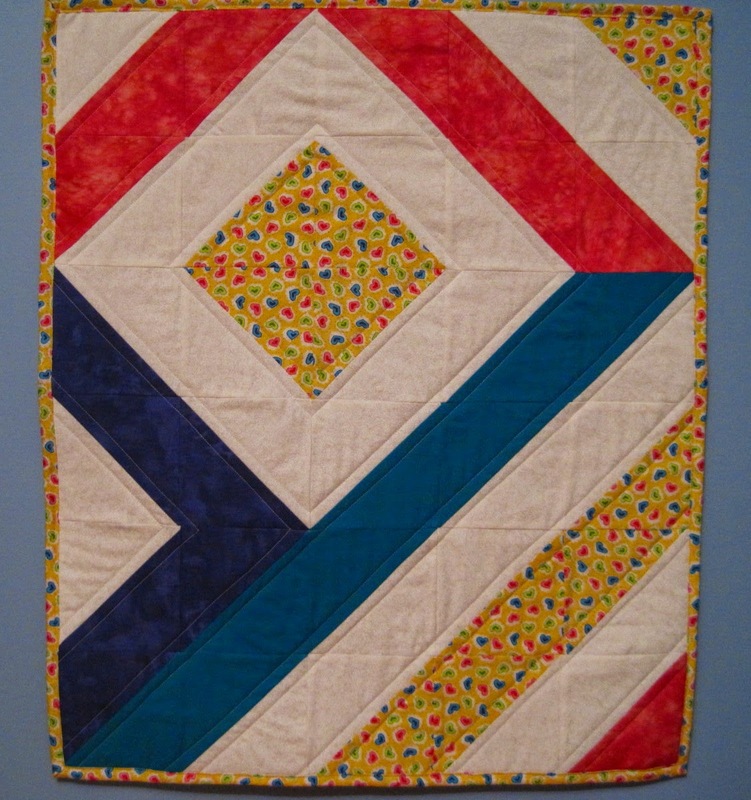 Thanks to my MMQG members for identifying the pattern in a photo of a quilt that I liked. 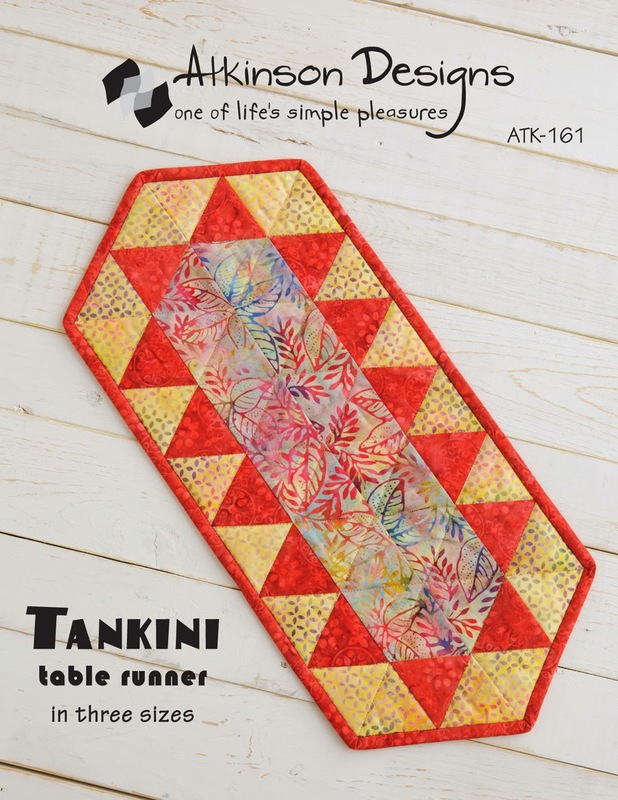 Tankini table runner by Atkinson Designs. I made the Merry-Go-Round table runner for a Bee Christmas gift, so I thought I'd try another pattern. Wishes Quilt Along by Fat Quarter Club. I purchased the fabric but somehow lost sight of this project. Better late than never. I need to figure out what gifts I'll be making this year so I won't be scrambling at the last minute.